After a difficult and painful first overnight hike , you might think I would not be eager to attempt another one. 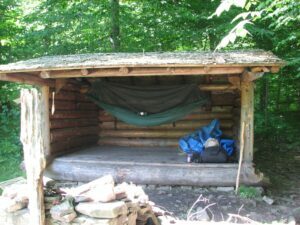 Although that hike had not gone as I had planned, I had enjoyed the overnight; the camp fire and sleeping in my hammock in the lean-to. There was also part of me that wanted to redeem the overnight hike. 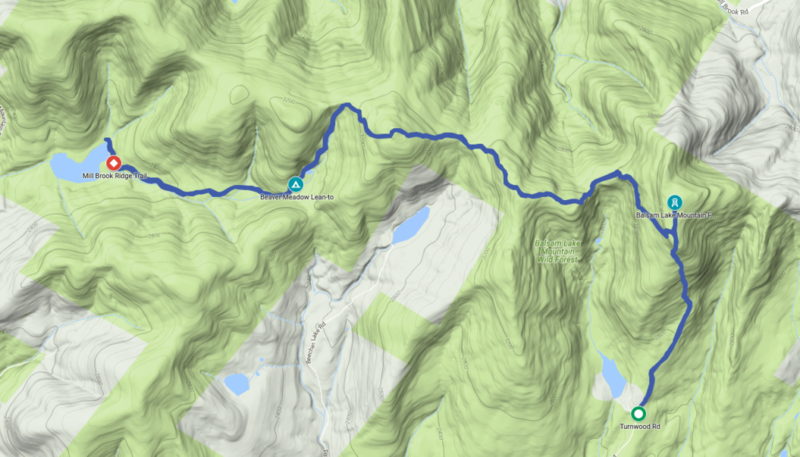 As with the first overnight, this one would also be in the Catskills, but now I knew what to expect and planned for it. 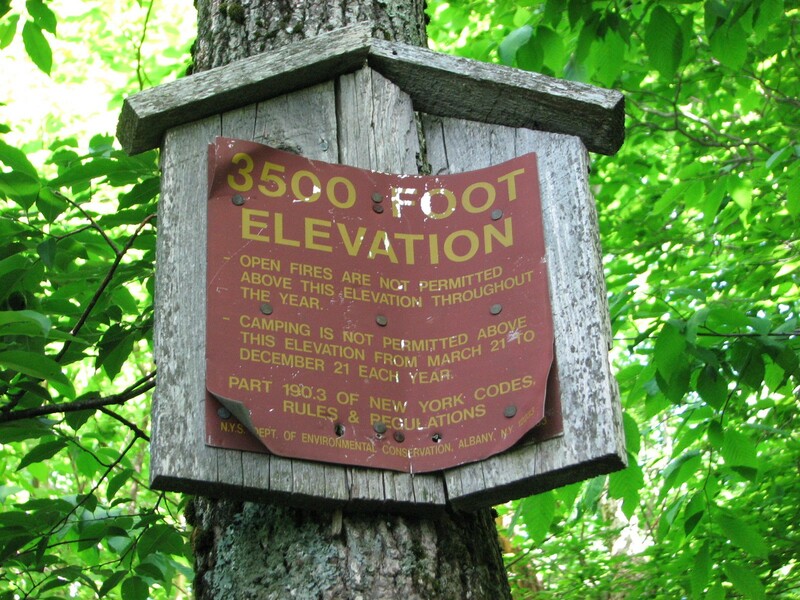 The hike would take me over the highest point of elevation on the FLT, 3660 feet. I planned to camp either at the Beaver Meadow Lean-to or at one of the campsites that surrounded Alder Lake. My previous hike’s turn-around point had been at Alder Lake and I knew that there were a number of tent sites scattered around the lake. I prepared my pack and supplies Friday night and left my house the next morning shortly before 6 am. The sun was already shining brightly in a nearly cloudless blue sky as I headed east on the highway. As I crested the top of hills along the highway I could see fog ahead of me that had settled in the valleys. One hour and 15 minutes later I left the highway at Livingston Manor and turned onto Old Route 17. Shortly after I turned off Old Route 17 onto Beaverkill Road; a well paved road with a line down the middle. I passed through the small town of Lew Beach. The road followed alongside the swiftly flowing Beaver Kill where I could see a few men fishing. On the other side a few houses and bed-and-breakfasts faced the road and stream. I came to the intersection of High Meadow Road. It branched off to the left and Beaverkill Road continued on past a house situated between the two roads. Just beyond the split in the road I saw dead-end sign. I began to wonder if I had possibly missed a turn, but I continued on. The road was still paved, although the center line had ended several miles earlier. I came around a long sharp right turn and continued beside the stream. A short distance later the road turned back to the left and became dirt and gravel. At this point I really began to think I was on the wrong road. I stubbornly decided I would go on just a little farther. The road narrowed as I continued on, at one point the Beaver Kill had washed away part of the road and it had become a very narrow one-lane road. The road finally turned away from the stream and headed into the woods. After several minutes I came to the end of the road and a parking area opened up off to my right. I had reached the trailhead. I changed into my boots and hoisted my heavy overnight pack and set off into the cool morning air. The path pushed through thick undergrowth for a short distance before it turned to the right and opened out onto what had once been a small dirt road. It had probably been an extension of Beaverkill Road that now dead-ended at the parking area. The old road was easy to walk and I moved along at a quick pace. 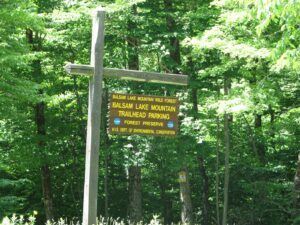 Soon it began to climb and then the trail turned left and began a steep climb up Balsam Lake Mountain (mile 0.9 – 8:31 am). The climb was rugged and steep in many locations. I climbed my way over and around large boulders and I needed to stop and rest periodically. 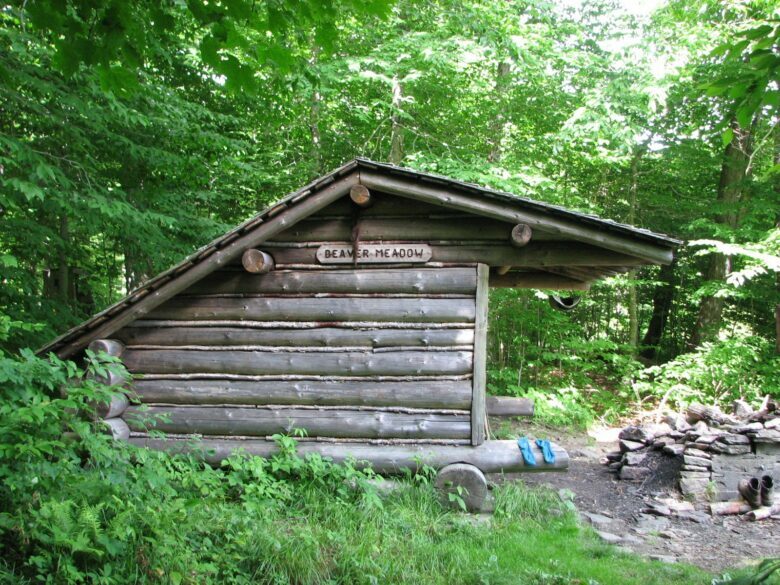 I passed a branch trail to my left that led to the Balsam Lake Mountain Lean-to. A short climb later I came to a marker indicating an elevation of 3500 feet and that no open fires were allowed above this point (mile 1.3 – 9:00 am). After climbing a few more feet I stopped and looked back. The trees had parted and I could see an incredible view of the hills to the south. I continued on up the path until I arrived at a junction (mile 1.5 – 9:13 am). 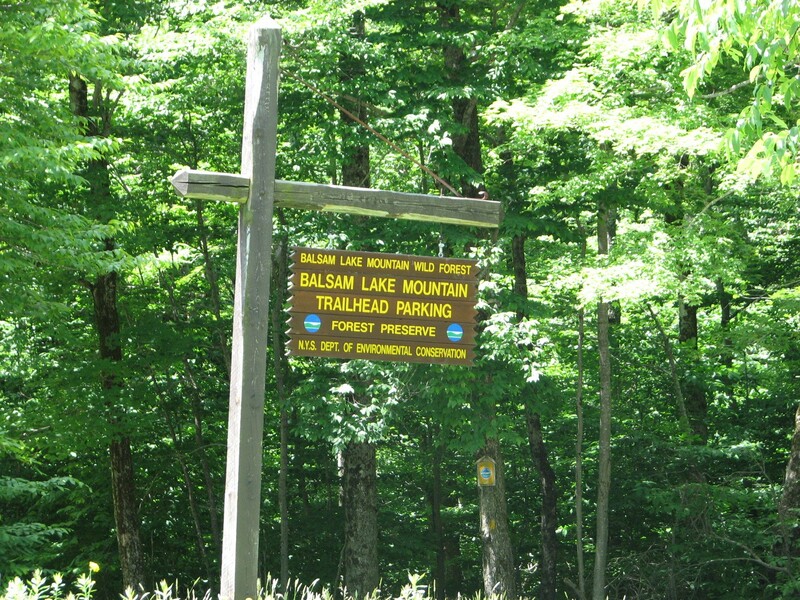 The main FLT trail turned off to the left and the path ahead led to the top of Balsam Lake Mountain and a fire tower. I considered continuing up to take a look, but I wanted to make sure that I reached my camp site with enough daylight left. I decided to leave that for another time; maybe on my way back. I turned left and continued on along the main FLT and a short distance later I reached the highest point of the FLT, 3660 feet (mile 1.6 – 9:14 am). There was no fanfare or even a marker, but the trail no longer climbed and was level. As I left the high point behind the trail turned to the left and began to descend. I passed another sign indicating 3500 feet as the trail passed through a switchback heading down. The trail turned and continued downward at an angle until turning slightly to follow along the edge. 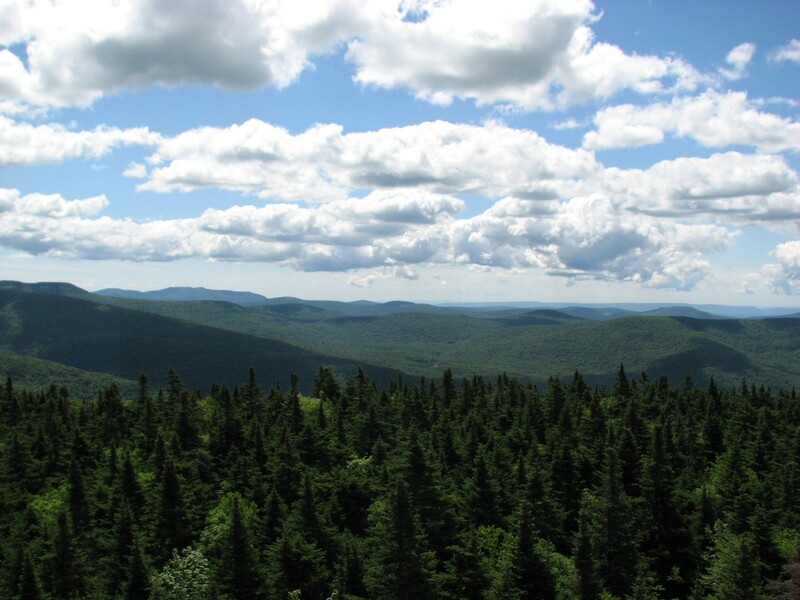 I could occasionally see breaks in the trees and the views beyond as the trail wound along the edge of the hills. The trail suddenly opened up into a clearing. I arrived at an overlook (mile 3.4 – 10:30 am). There was a large rock that provided a little extra height so that I could see over some of the trees. Below me I could see Beecher Lake. After taking a few pictures I decide to take a short rest before continuing on. 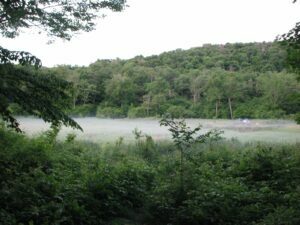 I left the clearing of the overlook behind and plunged back into the woods. As I continued on I periodically checked my GPS unit and saw that the trail was heading toward a small hill. I expected that it would turn and continue to follow along the edge of the hills, but it continued straight on heading for the hilltop. I muttered under my breath, “of course it’s going right over the top of the hill”. Just before reaching the top of the hill I needed to take a rest, my pack was weighing me down. After passing over the top of the hill the trail descended back down the other side and turned gradually to the right. A short distance later the trail turned sharply left and began to descend quickly. I came to a recently fallen tree on a steep section of the trail and had to work my way carefully through the branches that still held leaves. The trail began to level out and I came to a flat section. The ground under the trees was covered with grasses and small green plants; it looked like a green carpet. I continued on and a small stream began to develop to my left. 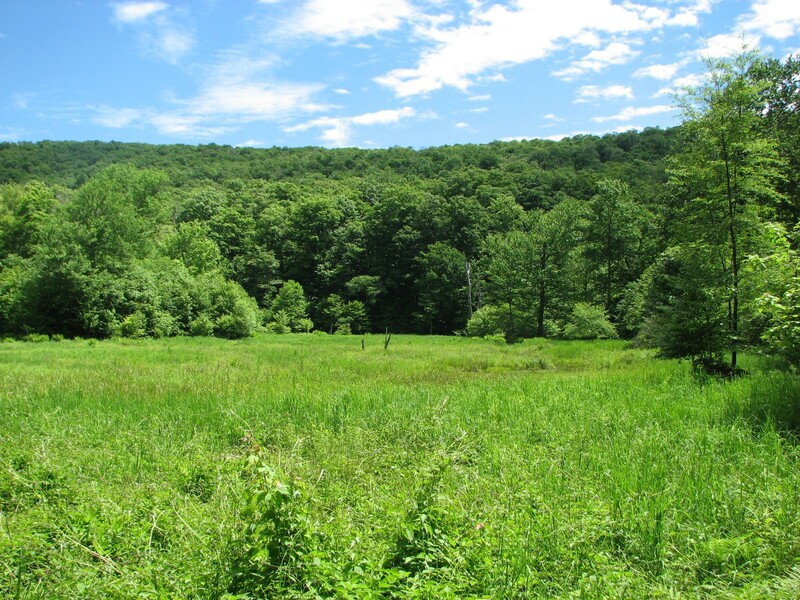 As I continued following the stream I came to an open area that was part field and part marshland (mile 5.6 – 12:00 pm). I stopped and walked out on a large rock next to the trail to take some pictures of the area. The sun was bright and warm and I could hear insects buzzing around. Shortly after I left the open area behind I met a group of women heading up the trail. They stepped to the side to wait for some of the stragglers in their group to catch up and let me pass. I said hello and continued on. A few minutes later I came to an intersection in the trail (mile 5.7 – 12:01 pm). The path to the left led down to the lean-to, I could just see it through the trees. To the right a sign indicated there was a spring. I could see that there was someone at the lean-to. I decided to continue on down to Alder Lake to my turn-around point and check out the campsites down there. There were several scattered around the lake and I thought I might find an available one. The trail was level and easy to walk and I was soon at the Millbrook Ridge Trail junction, my turn-around point (mile 7.2 – 12:40 pm). I continued on to the trail that looped around Alder Lake to look for any open camp sites. Every site I passed was in use. Finally, after passing several more that were also in use, I gave up and decided to head back. Maybe the lean-to was open now or I might be able to use the tent site that the map indicated was near the lean-to. As I arrived back at the intersection a man was coming up from the lean-to (mile 9.2 – 1:37 pm). He had just packed up and was leaving and said that I could have it if I wanted it. Perfect timing! He told me he had offered it to a group of women (the same group I had seen earlier), but they had declined. Instead they had pitched their tents out in the field in front of the lean-to. I told him that I was hiking the FLT, that I had come from Turnwood Road and had already hiked about 9 miles today. I told him I usually hiked 16 – 20 miles per hike. He commented that I must have “legs of steel” to hike that far. After chatting for several minutes he said his goodbyes and headed back toward Alder Lake. I headed down to the lean-to and dropped my pack. Someone had left a blue tarp wadded up in one corner. I took off my boots and socks and got my sandals out so that I could rest my feet for a bit. I hung my hammock up, unzipped the bug netting, and placed my sleeping bag and blanket inside. A little while later I heard some voices approaching, three younger men, probably in their twenties, appeared around the corner of the lean-to. They were hoping to use the lean-to. I told them I thought there was a tent camping site not far up the trail. They headed off to look for it. After eating some lunch I decided to start gathering wood for a fire. I kept my sandals on and walked up and down the main trail. There were plenty of fallen branches and small logs just off the trail. I was able to get a good pile in short order and decide to take a break before going back out to gather more wood. I always remember the adage, “get as much firewood as you think you need, and then do it again”. After I finished my second round of gathering I sat and enjoyed the warm late afternoon. As I relaxed I heard the young men again. They had found the tent site, but it was too small, so they decided to head out into the field in front of the lean-to. The women’s tents were in the front of the field so they headed toward the back, crossing the small Alder Creek and camping just beyond its banks. I decided to check out the spring that was on the opposite side of the main trail from the lean-to. 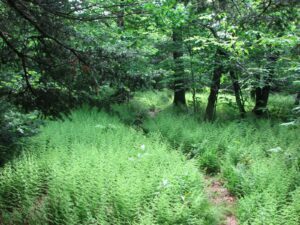 I walked up the trail and soon was surrounded by a large patch of stinging nettles, an irritating plant I had found often in the Catskills. It would cause a stinging and itching sensation wherever it touched your skin that lasted for several minutes. Scratching at it would only make it worse. I tried not to touch any of the plants, but still managed to get a little of the burning-itch. The spring was running clear and quick. I cupped my hands under the running water and took a sip, it was cold and refreshing. I headed back down to the lean-to. The sun was beginning to sink toward the horizon and the shadows had lengthened. I decided it was time to get my fire going. Soon I had a nice blaze. As I sat watching the fire two of the women from the camp passed by. They saw my fire and asked if I would mind if they all stopped up later and used it to cook their dinners. I told them they were welcome to. The sun faded and the darkness began to pull down over the woods and field. I set about cooking my dinner of hot dogs and beans. I listened to the crackle of the fire in front of me and the chirping of crickets and tree frogs. The women came up to cook their meals. Most of them had the “camp ration” pouches that you just added hot water to. It didn’t look all that appealing to me. We chatted for a bit before they said goodbye and headed back to their tents. The young men in the field were making a fair amount of noise. They had gone to the edge of the woods and where pulling down a large dead tree and whooping and hollering as it came down. I feared I might be getting to sleep late, but as their huge fire blazed they quieted with only a few loud outburst and those too soon faded away. I was beginning to feel sleepy and decided to turn in. The night sky was clear and I could see the stars above me. It was also chilling down quickly. I had changed into jeans earlier and had pulled on a sweatshirt. I decided to keep them on and climbed into my sleeping bag inside my hammock and quickly feel asleep. 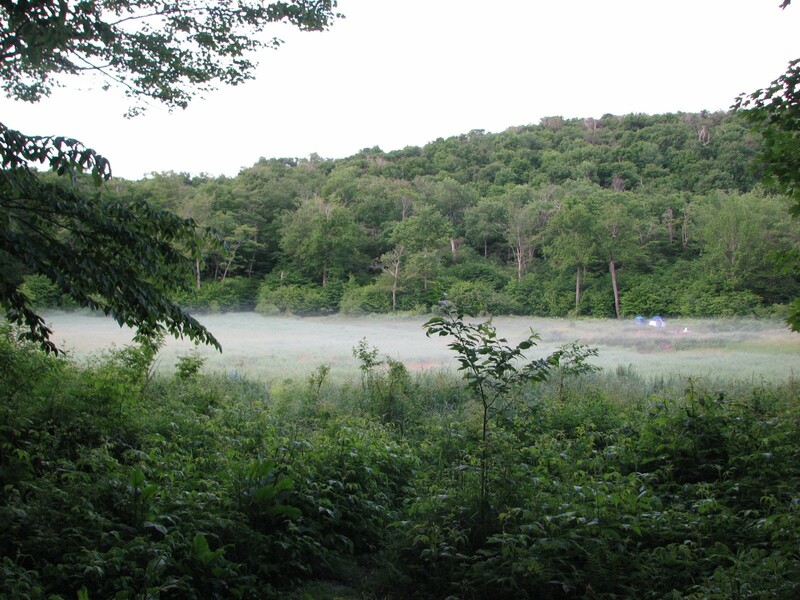 Fog blankets the field in front of Beaver Meadow Lean-to. I woke before the sun and looked out into the gray misty pre-dawn. I could see fog had settled on the field. It was still and quiet, none of my neighbors were awake yet. I reluctantly left my warm sleeping bag for the chilly morning air so that I could get my fire restarted. Soon I had water heated for my breakfast of oatmeal and hot chocolate. The warmth of the food helped warm me and drive away the chill of the morning. I began breaking camp and re-packing all of my supplies. I walked up to the spring and filled a few of my empty water bottles. Once I had everything ready I set out heading back to Turnwood Road and my car (mile 9.3 – 7:31 am). I passed back by the field/marshland and then begin to climb back up to the ridge. The air was still damp from the fog and dew of the morning. I was beginning to sweat from the exertion of the climb. I pushed on up to the ridge, climbing past the fallen tree, before I stopped and changed into shorts and a short-sleeve shirt (mile 10.1 – 8:03 am). I climbed back up to the top of the small hill, stopping for a brief rest at the top. I soon found myself back at the Beecher Lake overlook (mile 11.7 – 9:08 am). There was a hawk or some bird of prey perched on a dead tree. I took a few pictures and rested before heading on. The trail continued on following the edge of the hills. 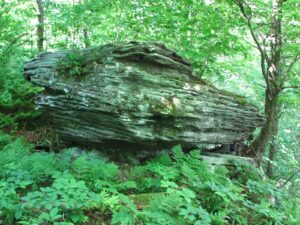 I passed by a large boulder perched on a pile of smaller rocks and tilted slightly over the edge. It almost looked as if some giant hand placed it on top of the smaller rocks. I imagined that someday it would shift and begin to slide down the hill. 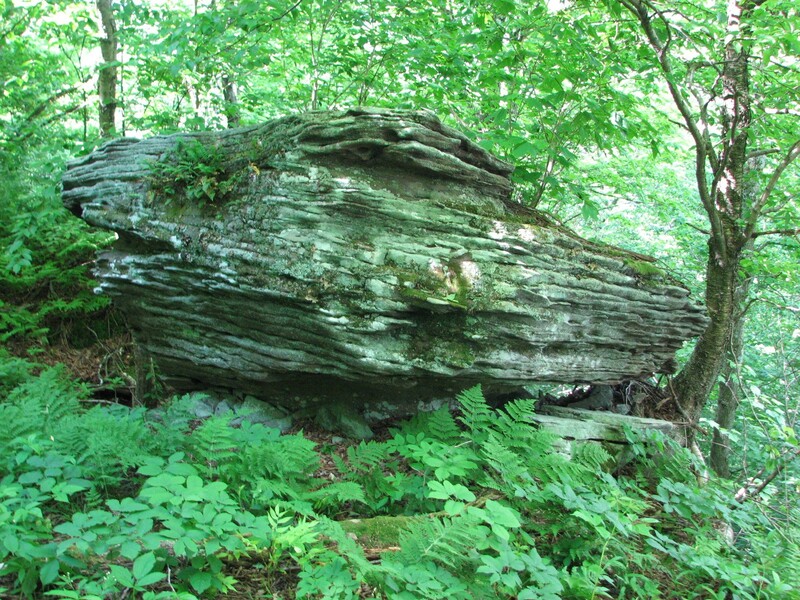 After leaving the large boulder behind the trail began to climb again. 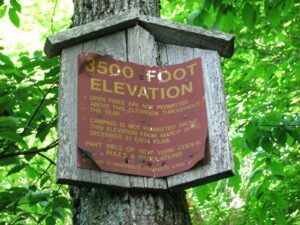 I passed the 3500 foot marker once again (mile 13.2 – 10:14 am) and soon after the trail started through the two switchbacks on its climb to the high point of the trail. 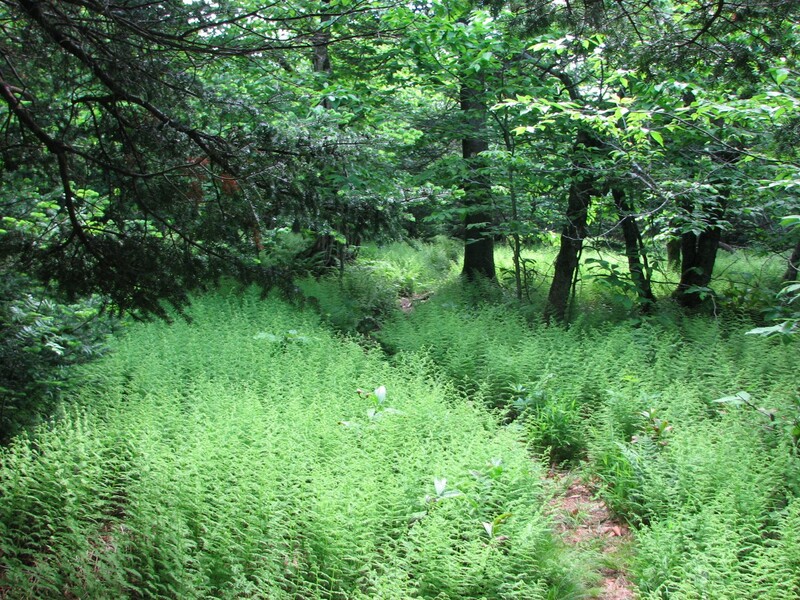 I pushed up the trail and finally I was back among the ferns in the level area that was the high point of the FLT. A few minutes later I was back at the trail junction (mile 13.5 – 10:37 am). The trail to the right would take me down the mountain and back to my car. To the left the trail led up to the top of Balsam Lake Mountain and the fire tower. I almost decided to continue down the mountain, but it was still early and I was curious. Besides it was only about a 1/4 mile to the top. View from Balsam Lake Mountain fire tower. I was surprised to find a number of people around. A man with a dog was sitting at a picnic table and told me that the tower had been renovated and people could climb to the top. I sat down and had a drink of water as some of the other visitors climbed up. I waited for them to come back down and then started my way up the steep stairs. At the top I met a volunteer named, Doug. He pointed out various landmarks including a couple of other fire towers perched atop other hills. He handed me a pair of binoculars and pointed out a cell tower near Port Jervis, NJ, nearly 50 miles away! Once I was back down on the ground I rested for a few more minutes before I picked up my pack and started down. A short time later I passed the junction and started down the steep section of the trail. I passed the 3500 foot mark and then on past the trail to the lean-to. My legs were hurting as I worked my way down. I moved as quickly as I could, hopping down over and around large boulders. Ahead of me I saw a couple that had been up at the fire tower earlier carefully picking their way down. I quickly passed by them and continued on down. Finally I was back on the old road, happy for the level ground, my legs feeling weak (mile 14.5 – 11:38 am). I moved quickly now heading down the easy path. Soon I turned off the old road and headed for the parking area. The trail broke out of the woods into the bright sunlight of the open parking area (mile 15.3 – 11:58 am). I arrived at my car, stowed my pack, changed into my sandals, and started the long drive back to the highway and home. I had redeemed my overnight hike. The weather had been perfect with the daytime highs in the low 70s and the overnight dropping to the low 40s. I also got a bonus of exploring the fire tower; I had not visited one before. Thank you, Scott, for another detailed report. Your descriptions help those who have hiked this section of the FLT to relive their adventures on the trail. You may be interested in pursuing the ADK’s Fire Tower Challenge in the Adirondacks and Catskills now that you have climbed at least one fire tower (perhaps you already have given the date of this hike). You may read more about this quest at http://www.adk-gfs.org/firetower.challenge.php. Good luck on the trail, and I look forward to reading about more of your adventures and viewing your photos. Thanks Jet. I have heard of the challenge, but have not started it as of yet – thanks for the link. My current challenge is to finish my E2E of the FLT. I still have a few more years before that is complete (due to limited time). I started these stories to help myself remember the hikes, I’m glad that you enjoy it and it helps others to remember the sections of the trail too.